Born and raised in Dublin, Ireland. Grew up in a small coastal town called Rush about 30km north of the city. Currently living in student accommodation in South Dublin, 10 minutes away from college. It’s the perfect location so can’t complain. Super close to campus and the Dublin mountains are on my doorstep! I borrowed my Mam's old racer when I was 14 and fell in love with the freedom and sense of adventure it gave me, 7 years later and I love it more than ever. I saved up and bought my own road bike and started racing at 15. Cruagh road, it’s 1.3km at 9.2%. There’s also an option to continue by going up Military road making it 5.9km at 6%. This is my favourite route to get into the Dublin mountains so it has become a regular on my rides. Short and sweet, the gradient is constant so no opportunity to recover. It twists its way up through the trees before opening up to a great view of the city. I’d use it mainly for my low cadence, high torque drills since the gradient is steep but also consistent. Is the Strava KOM for the climb ever in your thoughts, or do you strictly focus on the goals of the current effort? Sadly not! Even though I’d like to consider myself a reasonable climber I’ve no ambitions to target the KOM. It’s currently held by Ryan Sherlock, a former conti rider. That being said (this is definitely Freddy and not in the true spirit of KOMs), I do have the KOM on the descent. I climbed Cruagh road 37 times in a row one day to complete a half Everest and as a result I got to practise the descent 37 times too. Last time down I fully committed and took far too many risks (I was 18 and thought I was invincible) but managed to set the fastest time, beating a former winner of the Red Bull Downhill World Champs Janos Kohler by 3 seconds. I’ve found a few gravel climbs that are more enjoyable than Cruagh but they’re almost too difficult to ride on a normal training spin! They’re over 15% in places and getting up requires more technical skill than power because the gravel is so loose. Great fun but riding at 30 rpm isn’t the best for training, wrecks the legs at the very beginning of the ride. My favourite climb has to be Flagstaff Road (4.6km at 6.7%) in Boulder, Colorado. I studied abroad in CU Boulder for my 3rd year of college and had the chance to ride some amazing climbs, Flagstaff being the best. It starts the second you leave campus and brings you into the front range of the Rocky mountains. The views of campus are stunning and there is a dirt descent you can take called Chapman Drive that connects the top of Flagstaff to the base of Boulder Canyon. I love gravel and dirt roads because the lack of grip has you on the limit on every corner, really boosts the excitement of the descent. Without a doubt it’s Magnolia road near Boulder. Right from the start is goes into a set of unfathomably tight and steep switchbacks, the first kilometer averages 14% but if you take the inside line of the first harpin you’ll hit a bike-length section at 43%! Magnolia then carries on for another 6km at 9.5%, it’s brutal and the surface turns to dirt about half way up just to add to the experience. I’ve some good memories of it though, it was one of the first climbs I rode in Colorado so the gradient combined with the lack of oxygen from not being acclimated to life at 1600m elevation made it something I’ll never forget. Also met Marcel Kittel and Rick Zabel at the top one day while they were on a training camp in the area. Nice, mixing with the pros won’t do you any harm! What kind of training do you do in general? Volume, volume, volume. I’m training 20+ hours a week, as high as 27 hours if I’m off college and have more time. It’s mainly endurance work with a few efforts but I get most of my high intensity work done in races. The last time was stage 8 of Rás Tailteann 2018, an 8 day UCI 2.2 race. It was my first time racing at that standard and I caught a stomach bug on stage 5 that wiped out all my energy. The race finishes in a town called Skerries every year which is only 5km from where I grew up. I used watch the finish when I was younger with the dream of one day taking part myself so even though I was sick I was determined to finish. It was the most unpleasant day I’ve ever had on a bike but all I could think about was getting to the line. I never caught back up with the bunch which was a shame because I was in contention for the Cat2 jersey earlier in the week but all hopes of that went away when I got sick. Turbo for sure, you can call me soft but I don’t think it’s worth the risk going out in conditions that bad. 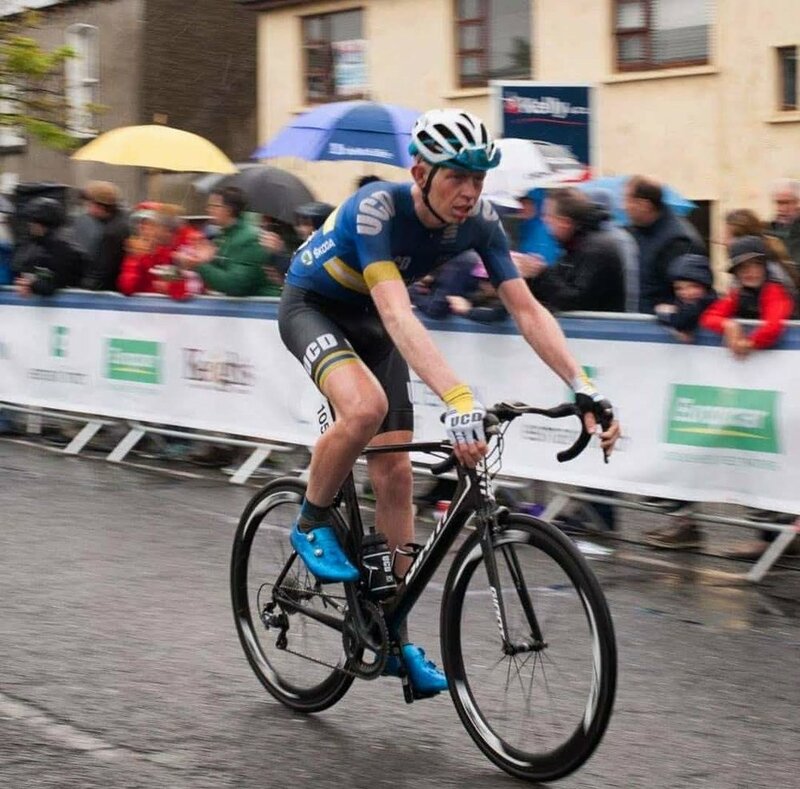 I’m riding for the college team, UCD-Fitzcycles.ie, it’s the highest ranked collegiate team in the country which was one of the main reasons I chose to study here. We’ve got great support from our sponsors Rocasports, Fitzcycles, Spirit Skoda and Live YPB. They make a huge difference as most students don’t have enough money to sustain a sport as expensive as cycling on their own. This season is all about getting some wins as a Cat1, I was competitive towards the end of last year but 3rd was the best I could manage. I’m studying theoretical physics which can be pretty intense so that takes up most of my time off the bike. The rest of it would mainly be chilling out listening to music, hanging out with my friends, watching YouTube and cooking. Anything with Mad Fiber wheels, they aren’t in production anymore but I’d love to get a set secondhand. I don’t think anything else comes close to looking as cool. Maybe put them on a Cervelo S5 with SRAM Etap, that would be a dream bike for sure. The Stelvio, it’s at the top of my bucket list of climbs. Draft Animals by Phil Gaimon. Either Adam Hansen or Julien Vermote. Hansen for his tech/physics based approach to the sport and Vermote if we’re talking about rider style. Love the way he can sit on the front of the peloton for hours controlling a break, he deserves far more credit than he gets. My custom UCD National Champs skinsuit from when we won the team pursuit in 2017. It has to be my favourite piece of kit simply because I never thought I’d be on a national champs winning team when I started riding.